After Georginio Wijnaldum's expertly-executed lob in Liverpool's 3-0 win over AFC Bournemouth raised the roof at Anfield on Saturday, we've picked out 10 more brilliant chipped finishes from a selection of Reds for you to enjoy. With so many great goals to choose from, it was difficult to limit ourselves to 10. Daniel Sturridge's derby-day dink, Luis Suarez's Spurs stunner and Luis Garcia's Norwich City strike all narrowly missed out. To see who did make it into our countdown, scroll down. Click the images to view footage of the goals, where available. Signed in August 1977 to replace Hamburg-bound Kop hero Kevin Keegan, Kenny Dalglish scored an incredible 31 goals in his debut season for Liverpool. The most memorable of those strikes arrived in the 1978 European Cup final against Club Brugge at Wembley. 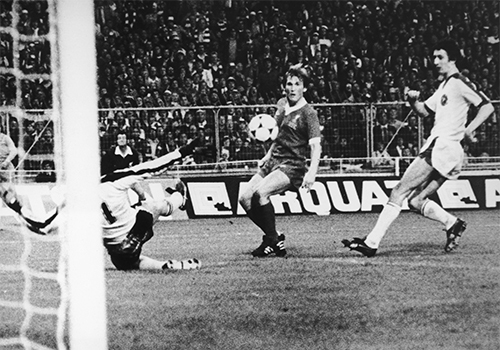 With a closely-fought match against Ernst Happel's Belgian champions all-square at 0-0, Dalglish latched onto Graeme Souness' clever pass through a packed defence and executed a beautifully-disguised chipped finish over onrushing goalkeeper Birger Jensen to give the Reds the lead. His 65th-minute strike proved decisive as the Reds won 1-0 and successfully retained their European title. It was the perfect way to cap a wonderful debut season for Dalglish, who would go on to win two more European Cups in 1981 and 1984. Ian Rush described Liverpool's ferocious two-legged European Cup semi-final against Dinamo Bucharest in 1984 as "the most brutal of my entire career" but still delivered a stunning two-goal performance in the Romanian capital to help book a place in the final. Leading 1-0 from the home the leg, Liverpool's all-time leading goalscorer broke the deadlock after 12 minutes with a delicate chip that put the Reds in control of the tie. 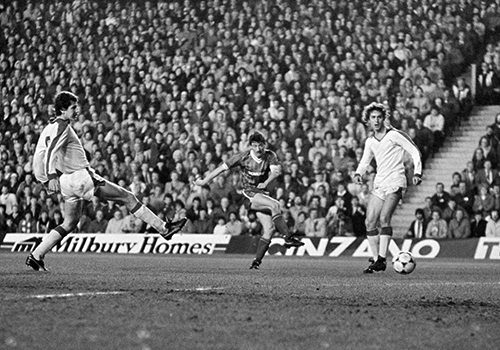 Graeme Souness' one-touch pass from Sammy Lee's half-cleared corner picked out Rush on the left of the Bucharest box and the Welshman did the rest; cutting into the box to beat his defender before dinking the ball over goalkeeper Dumitru Moraru as he came out to narrow the angle. 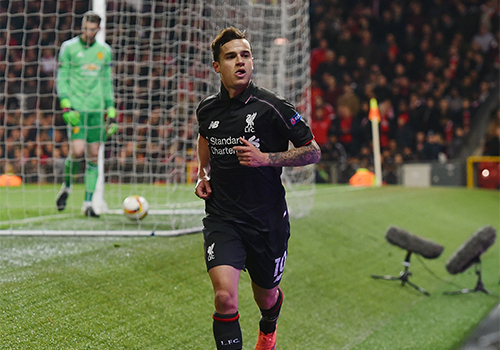 Rush added a second goal six minutes from time as the Reds won 2-1 (3-1 on aggregate). They would go on to beat AS Roma in the final to win the European Cup for a fourth time. The pre-match headlines had all been about Eric Cantona's return to the Manchester United side following his nine-month ban, but the post-match talk was dominated by Robbie Fowler's sensational brace that secured a 2-2 draw at Old Trafford. His first a thunderous strike that beat Peter Schmeichel at his near post and nearly tore a hole in the roof of the net; his second a lob oozing with audacity. Racing onto Michael Thomas' through-pass down the left flank, Fowler outmuscled Gary Neville to a 50-50 ball, burst into the box and chipped the goalkeeper with wonderful nonchalance... and with his 'weaker' right foot too. 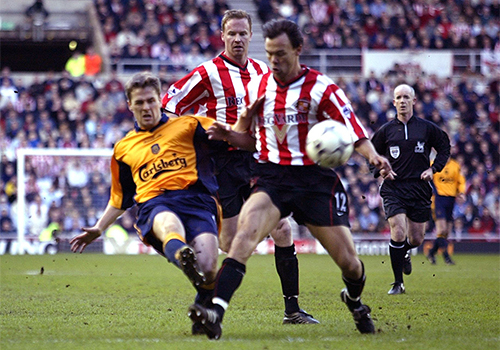 Michael Owen executed a brilliant lob over Thomas Sorensen to give Gerard Houllier's Reds a valuable 1-0 win at the Stadium of Light and keep his side within one point of Premier League leaders Arsenal in April 2002. With 55 minutes gone, Owen latched onto Steven Gerrard's searching forward pass and, while falling backwards under pressure from Sunderland defender Joachim Bjorklund, lifted the ball up and over the 'keeper from the edge of the box. 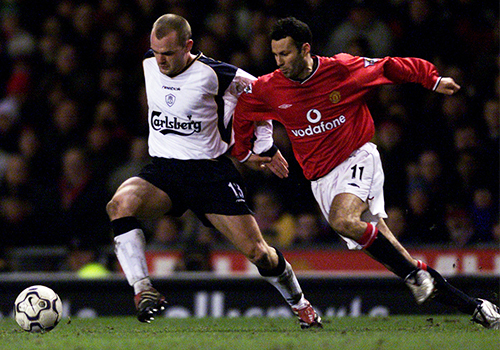 Having secured Liverpool's first win at Old Trafford for 10 years with a spectacular free-kick the season prior, Danny Murphy broke Manchester United hearts once again in 2001-02 - and in stunning fashion, too. With 84 minutes on the clock, Steven Gerrard picked out Murphy's diagonal run across the box with a perfect through-ball. The No.13 only had time for a single touch as Laurent Blanc closed him down, but with it, Murphy clipped the ball over the centre-back and goalkeeper Fabian Barthez to stun the Stretford End. Murphy's dramatic winner secured a fifth consecutive victory over United for Gerard Houllier's Reds in all competitions. Luis Suarez scored more goals against Norwich City (12) than any other club during his Anfield career - and they were usually of the very highest standard. 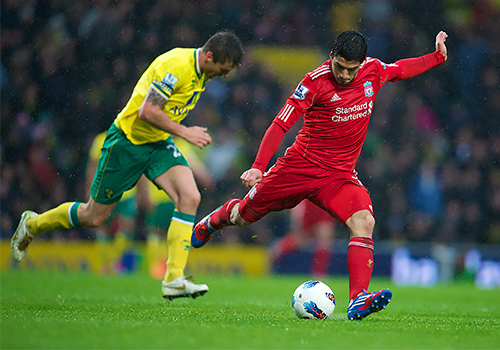 Having already helped himself to two during this 3-0 Premier League win at Carrow Road, the Uruguayan completed his first hat-trick for the Reds with an outrageous 42-yard strike. 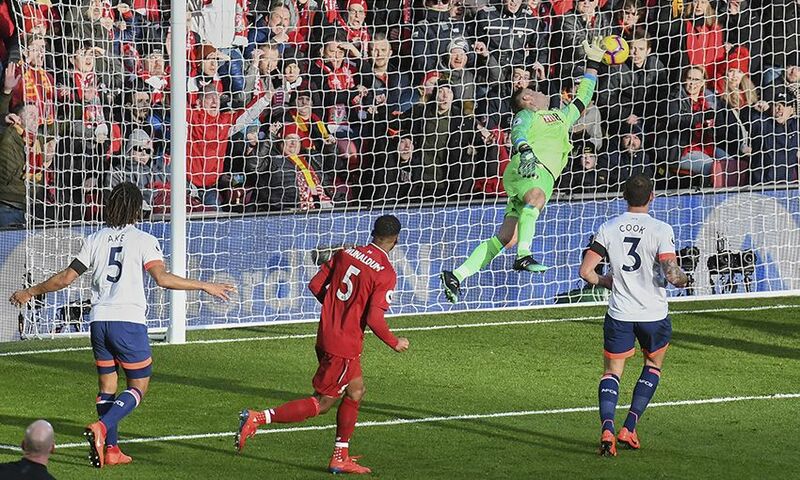 After beating defender Elliott Ward on the halfway line to collect Glen Johnson's clearance, the No.7 raced forward, spotted John Ruddy off his line and sent a sensational chip over the outstretched hand of the flailing goalkeeper and into the net. "I was about to have a go at him for a having a ridiculous shot!," admitted captain Steven Gerrard afterwards. 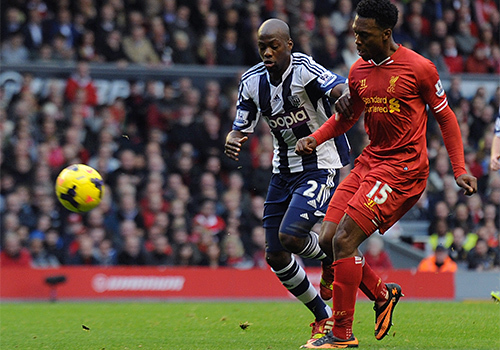 Daniel Sturridge's partnership with Luis Suarez helped fire Liverpool to within two points of the Premier League title in 2013-14 season and their blossoming understanding was plain for all to see against West Brom. Suarez may have taken the headlines with a hat-trick, but it was Sturridge who scored arguably the best goal of this 4-1 win at Anfield: a superb 20-yard chip over Boaz Myhill. Taking possession in midfield, the No.15 shrugged off the attentions of Youssuf Mulumbu and drove towards goal. A few yards shy of the edge of the box, he spotted the 'keeper marginally off his line and dinked a pint-point shot between Myhill's outstretched hand and the crossbar. Philippe Coutinho's brilliant solo goal at Old Trafford killed Manchester United's hopes of a comeback in the second leg of this Europa League clash as Jürgen Klopp's Reds rolled on to the quarter-finals. The Brazilian picked up the ball on the left flank, breezed past Guillermo Varela and with everybody inside the stadium expecting a cut-back, lifted a cheeky shot past David de Gea at his near post. It was a beautifully clever strike to make it 1-1 on the night (3-1 on aggregate), and it would later be named LFC's Goal of the Year. Manchester City arrived at Anfield unbeaten in domestic competition since the start of the 2017-18 season. Mohamed Salah's brilliant lobbed finish from 36 yards out ensured the visitors went home on the wrong end of a 4-3 defeat. With strike partners Roberto Firmino and Sadio Mane netting Liverpool's second and third goals moments earlier, Salah got in on the act in superb style. 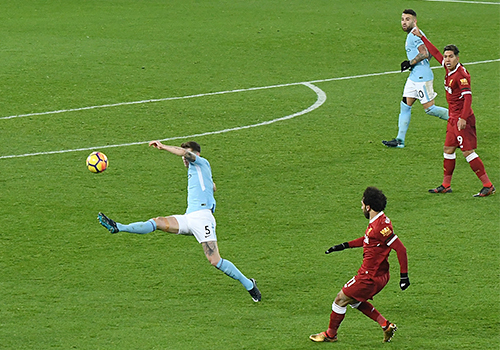 The Egyptian's through-ball forced sweeper-keeper Ederson to rush out of his area and attempt to clear the ball down the pitch - but his effort only reached as far as Salah, who sent it back from whence it came. Taking one touch to cushion the clearance, the No.11 lofted a curling shot over the keeper that nestled nicely in the centre of the goal. But while Salah's aforementioned goal was certainly a stunner, it could be argued that it wasn't even the best lobbed finish of the match. 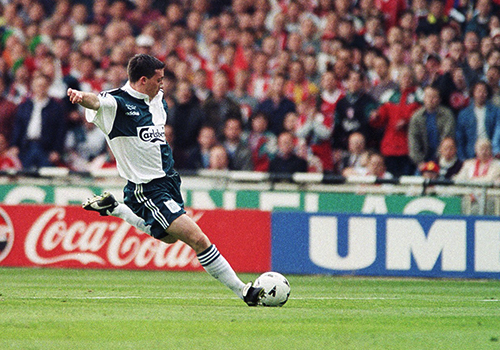 Firmino's game-changing strike just nine minutes earlier to make it 2-1 was at least equally brilliant - and bore an uncanny resemblance to Robbie Fowler's goal against Manchester United back in 1995. 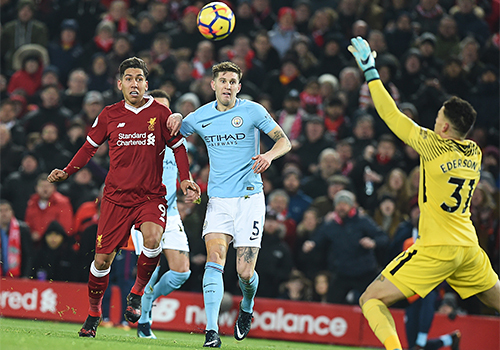 Racing onto Alex Oxlade-Chamberlain's through-pass down the left, Firmino shrugged off John Stones, raced into the box and chipped home gloriously. Sound familiar? Click on the image above to view Fowler and Firmino's goals side by side to compare for yourself.